How to build a "Budget worm farm"
Building a budget worm farm is really easy and can be done in less than 3 minutes… Well that is about my record time so far…but I am sure it can be done even quicker. It all depends on your expectations of the worm bin you would like to own! If it is your goal to keep the cost of your worm bin as low as possible then have a look at my hanging bag worm farms. While the hanging bags are extremely low cost worm farms they will probably fall short on durability, looks and maybe size. 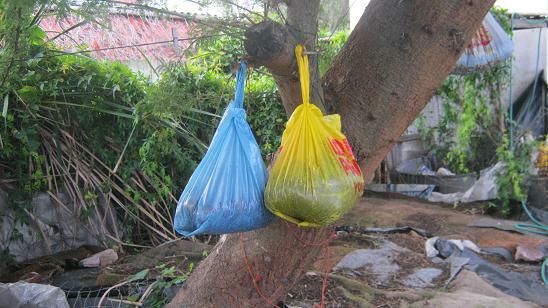 My wife for one is not really a great fan of worm bags in a tree! Her being an artist might have something to do with it. But the earthworms themselves are really not fussy at all and will gladly live in any kind of worm farm as long as their needs are met. There are so many kinds of containers you can use to build a worm farm. There is probably a good chance that you have your future budget worm farm already somewhere in your home, garden or garage. Some examples of low cost worm bins. 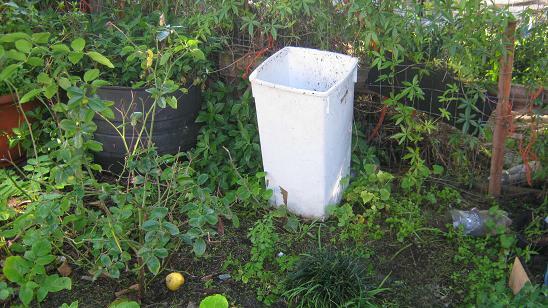 An old plastic bucket, bin or container will make an excellent budget worm farm. So have a look around and see if you find yourself a suitable container. 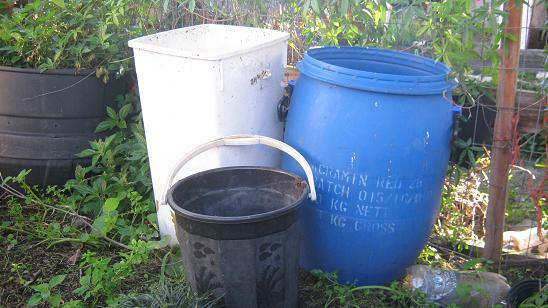 The bucket, bin or container should be at least 20 liter / 5.284 gallons in size. Note that the larger the surface area of your container the more earthworms will your budget worm farm be able to hold. Once you got your container just follow the simple construction manual below and build your budget worm farm in no time! 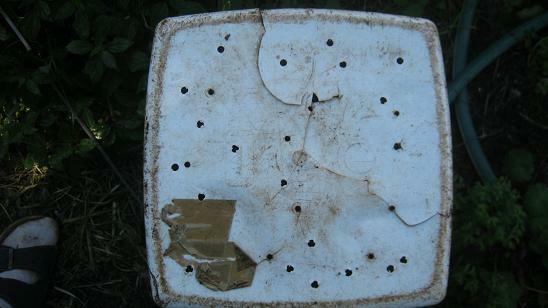 The bottom of a budget worm bin with drainage holes. A low cost worm farm standing under a tree. Make sure you drill a sufficient amount of holes into your worm bin. Your Earthworms survival might depend on it. Earthworms breath through their skin and can drown if their environment gets flooded. Next you need to find a nice spot for your worm farm. A shady place is usually advisable. This can protect your worms from getting cooked in the sun on a very hot day! A place under a tree is normally a good spot! Now you are basically done already! It's that simple! Add your worm bedding, your earthworms, some worm food and cover the food with a plastic bag or sheet. That will keep the moisture levels high inside the worm bin and act as a natural barrier against predators. A lid is not necessary but if you want to add a lid to your worm farm just find a suitable plastic sheet or wooden board. Cut it to size and place it on top of your bin. the end of the year. But if you only want to keep the costs low and just recycle your kitchen- and garden waste at home than using a worm farm like those above will be perfectly fine and will be doing the job! To find out what else you need to start your worm farm click here. Click here to find out how to set up and maintain your worm bin! To go from “Budget worm farm” to the “Home Page” click here!